Remember the fluffy 1998 romantic comedy, You've Got Mail, directed by Nora Ephron? I stumbled on the last half recently while watching TV in a mind-numbed state -- instead of doing what I should have been doing. On the surface, it's a sweet story about a girl (Meg Ryan) and guy (Tom Hanks) who fall in love via their online correspondence. At the time, email was a novelty and modems made eerie outer space sounds during the connection process. Underneath the fluff, was a darker David and Goliath subplot I'd kind of forgotten about. 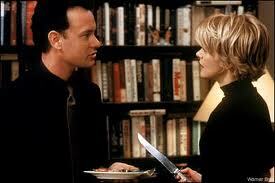 The Tom Hanks character owns a chain bookstore that mows down Meg Ryan's small independent children's book shop. Watching it now, the movie seemed like a quaint period piece, even though it was just 13 years ago. There was something oddly nostalgic about watching an indie bookseller being trounced by a chain bookstore from today's perspective, when one of the Goliath book chains has just come tumbling down. Anyway, everything ends up okay in the end. Meg Ryan's character writes a children's book, and everyone lives happily ever after. I know things have been gloomy here lately, but don't worry, I promise some fun things are coming up soon, like the blog tour for Quacky Baseball -- the new picture book by Peter Abrahams, illustrated by Frank Morrison -- that just came out this week (Harper Collins). Please stay tuned. In the meantime, seen any good nostalgic movies lately? I think Meg Ryan's career got mowed down too. Bah! Humbug. Gloom is good. I watched the original Planet of the Apes. Sigh. The good old days. The gloom is lifting. I am really happy that Quacky Baseball is finally coming out. This is very good news! I had pre-ordered it and the book should be on my doorstep tomorrow or next week. The Blog Tour for this will be so much fun! I can’t wait. Do you think there is any chance of you interviewing the Illustrator? It is interesting to look at it from a business/tech point of view. I forgot about You've Got Mail! Now that plot seems prophetic, huh? So sad. I recently watched Sleepless in Seattle, which is one of my favorites. I'm a sucker for chick flicks. Can't wait to read Quacky Baseball! I used to live in LA and there was an old-time movie theatre that showed all of those old movies for about a buck. I loved them. No loud earsplitting scenes, graphic violence, dumbed-down conversation. What fun. It's closed now, but I know if I wasn't asleep by 9 every night, I'd find them on TV. You may be right, Michael. Where is Meg these days? Dear Grunt, Were the good old days that good? I agree, Shenee and Jacqui. There is a comfort in old movies, just like there is in old music. Is it because we know what's coming next or because they remind us of those days? In the good old day, all we had to worry about was the Hydrogen bomb, the International Communist Conspiracy, and Rolaids. Megan, I hope the reason you haven’t posted anything new for quite some time is because you have been very busy getting the Quacky Baseball blog tour together. I also really hope you are feeling okay and everything is okeey dokeey. -Concerned plus Good and Old. Thank you for your concern, Lee Rae. You are very good! There have been some delays getting the blog tour for Quacky Baseball together. I think it is going to happen the week of March 14 but I'll confirm that soon. Hope everything's okay with you too! "Not the cheeriest topic, but some useful info." At least breakfast is a cheerful topic! Speaking of nostalgia, I watched Jaws the other day. That darned movie still made me jump even though I knew when the scary parts were coming up. It’s still great after all these years! Not one computer or cell phone to be seen. Although, the shark was wearing his built in GPS system. Mea culpa for not writing a new post today. Not feeling tip top. Think it had something to do with a raw oyster. The ocean has scarier things in it than sharks, although I'm a diver and I love the sea. I must write a new post. I must write a new post. I must write a new post. I must write a new post. I must write a new post.